FI was doing an oil change and i wanted to change my oil filter while im here but reading my Haynes manual it says for later models (mines ‘91) i need a special tool to remove the filter, does anyone have any techniques or do i just need to buy the special tool? @DBRMN wrote: need a special tool to remove the filter, does anyone have any techniques or do i just need to buy the special tool? This is the project bike from 2017 and this is its first oil filter? Post a picture of the special tool, or its description. @DBRMN wrote: FI was doing an oil change and i wanted to change my oil filter while im here but reading my Haynes manual it says for later models (mines ‘91) i need a special tool to remove the filter, does anyone have any techniques or do i just need to buy the special tool? The filter wrench size depends on whether you've bought a non-genuine oil filter or have gone for one that's listed for K Bikes. 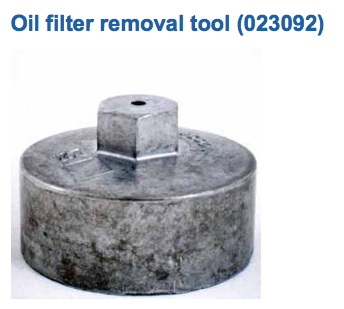 ALL K75, K100, K1100 & K1200 Bricks use the same oil filter. It also fits ALL Oilheads 850, 1100 & 1150. It has 14 'flutes' and measures...dammit, either 74 or 76mm. I am suffering from CRS at the mo'. Motobins, et al, sell them. As TWB indicates, there is nothing special about a cap-style oil filter wrench being the preferred tool to use for a classic K-bike oil filter change, regardless of year. 14 flutes by 76mm. What I want to know is from DBRMN. What does his Haynes manual indicate is special? 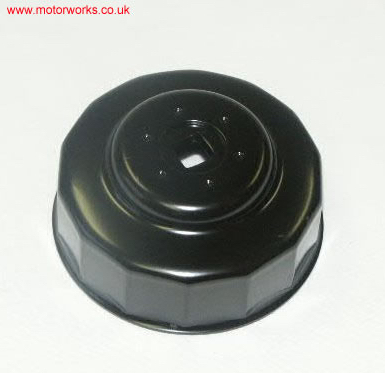 @Two Wheels Better wrote: ALL K75, K100, K1100 & K1200 Bricks use the same oil filter. It also fits ALL Oilheads 850, 1100 & 1150. It also fits all Tonti-framed Moto Guzzis from 1969 - 2003, but I bet you didn't want to know that! 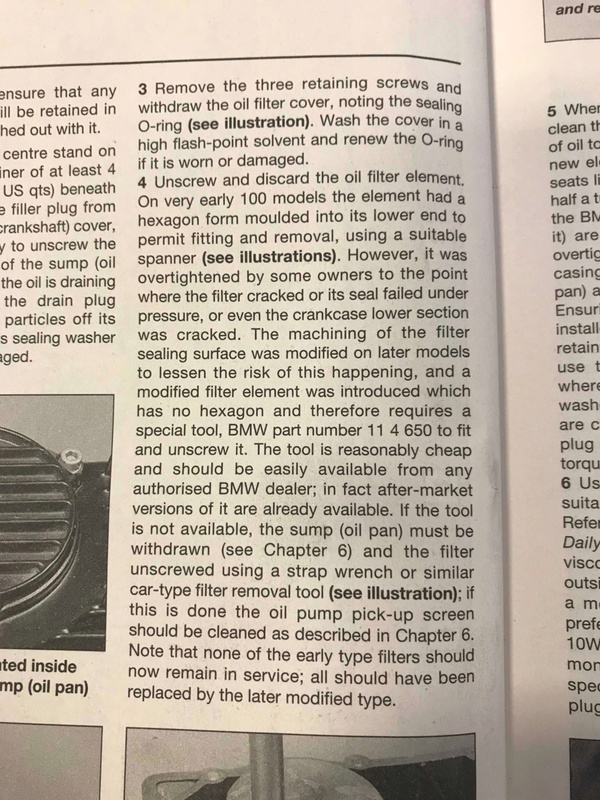 Without wishing to put words in his mouth, I suspect that the "special" tool referred to in the manual is simple recognition that you can't get the oil filter out or in again easily without it, due to it being tucked up inside the oil pan - hence you need a special tool. It is not special (unique) to K bikes and widely available from the usual outlets (£8.70 from Motorworks for one version (top pic) and £9.30 from James Sherlock for another version - bottom pic). Get a metal one if you can. Less prone to slipping than plastic. @Born Again Eccentric wrote: Without wishing to put words in his mouth, . . .
Tell whoever is forcing you to do that to stop right this minute. What caught my interest was that he said it was for later models like his. I thought it might have been a mischievous change made by a bored copy editor bent on subversion. I think the editors at Haynes (just down the road from where I live) are kept busy enough keeping up with all the new tin boxes flooding onto the market without needing to worry about updating a manual that they produced for the K75/K100 way back when. Probably just sneak out a re-print now and again (mine is dated 1999) rather than a refreshed version. I think the editors at Haynes . . . In other words, go get a cap-type oil filter wrench if you haven't got one already that fits the description repeated ad nauseam here, DBRMN, and change the oil filter. It's overdue. There's nothing special about your model—except how you've modified it, of course. Or of course you can take the sump pan off and use a strap type filter wrench if you have one. And you'll be able to clean out the intake. Funny that, I arrived back in OZ with a new oil filter, and I thought enough tools in my shed for the job, but I'd left one of the three oil filter wrenches I own back in the States. Off came the sump and into the side of the filter went a long screwdriver to spin it off with. Doh! It's only 13 Allen head screws, but at least the sump is clean, a new bead of Drei Bond seals it up and the pickup screen is clean, too. Bike has not been on the road yet, it's still under construction so has not had the need for one. I don't think this would work, I'll take a picture today, my filter has a smooth bottom with no indent or anything. There's no indent in the bottom, nothing protruding, unless it's a K&N brand. Look at the edge and the tool pictured above in the replies, #3. It grasps the filter from the bottom sides. A closer look will reveal all. 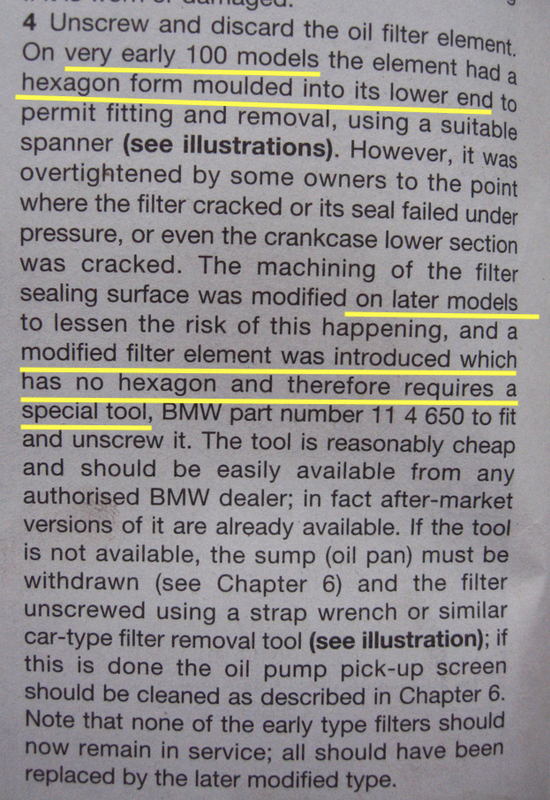 @Tesla13BMW wrote: Or of course you can take the sump pan off and use a strap type filter wrench if you have one. And you'll be able to clean out the intake. That's quite a good idea actually. @DBRMN wrote: That's quite a good idea actually. It is a good idea. You still should have a cup-style wrench and skill to use it so you can keep up with these two riders. Like TWB indicates, just remove the round filter cover, push the cap wrench onto the filter, use a ratchet wrench with an extension to wind it out of there. 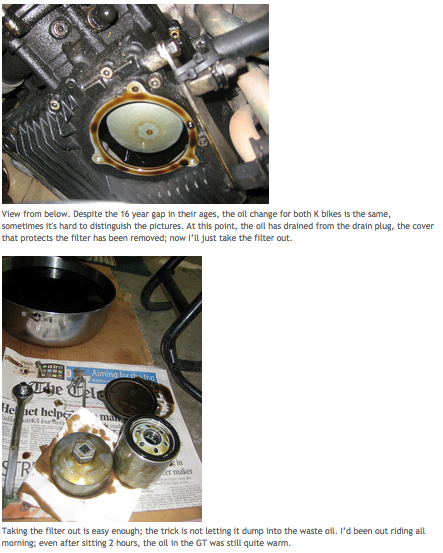 Also note that there's no real need to remove the drain plug when changing the oil if you're replacing the filter. 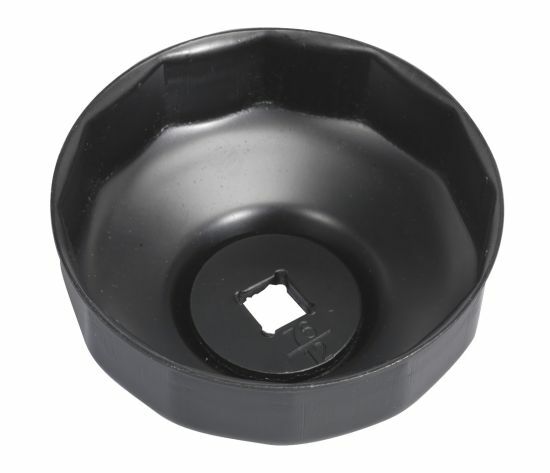 You want to have a pan underneath to filter cover anyhow so removing and reinstalling the drain plug is not necessary. Just make sure it's a big pan / drip tray. When you knock off the filter sump the oil comes out in a hellova rush. For what it takes in effort it’s worth cleaning the sump out if you haven’t already. I was amazed how much crap was sat in there. @nobbylon wrote: For what it takes in effort it’s worth cleaning the sump out if you haven’t already. I was amazed how much crap was sat in there. Ye I think I will remove the sump to make sure there's not too much crap in there. @Dai wrote: Just make sure it's a big pan / drip tray. When you knock off the filter sump the oil comes out in a hellova rush. Even undoing the plug the oil came out so fast I panicked lol it was fine though very close to spilling. My 1983 K100 is ex-Japan. A Sumo wrestler must have tightened the oil filter on. After acquiring the bike I did an oil and oil filter change. The filter was put on so tight I broke the pressed steel oil filter tool trying too remove it. After various subsequent failed efforts to remove it I drove two 10mm bolts through the filter body and applied massive leverage with a 600mm long breaker bar with the end placed between the 2 bolts. Eventually the filter broke loose and I was able to remove it. The pressure applied was so great that I was worried I was going to break the Ali casting that the filter screws into. LESSON: lubricate the the rubber seal ring at the base of your filter when installing do not over tighten it. Bet whoever changed the oil filter last, did not put a smear of oil on the rubber gasket! I worked at a service station years ago and we'd get the wife bringing in the car with the jammed filter that her husband couldn't get off ;-) Some were a real Peter to remove. Sometimes the rubber would strip from the filter. The real bad ones that were also put on too tight would end up twisting the oil filter casing so bad and still couldn't remove them. We'd then drive a screwdriver through the casing and get it off eventually. Also check that the rubber gasket isn't stuck to the sump before the new filter is put on. Oil on the gasket, spin 'em up finger tight, then a good twist of the wrist - all that's needed.